This is a cake I usually do when summer begins, when the berries are at their best. It is an interesting cake, it is made by three different layers with different consistencies: crumbly, soft and rich. Perfect for afternoon breaks outdoors. Prepare the crumble first: cut the butter into small cubes, add it to flour and sugar and work them all together with your fingers, as quicker as you can. Create crumbles and chill in the fridge. Then prapare the cheese layer: whisk together ricotta and egg yolks. Beat the egg whites until stiff and add them to the mixture. Set aside. Finally prepare the base: beat together butter and sugar until soft and fluffy. Add the eggs, one at a time. Then add the flour sifted with baking powder. 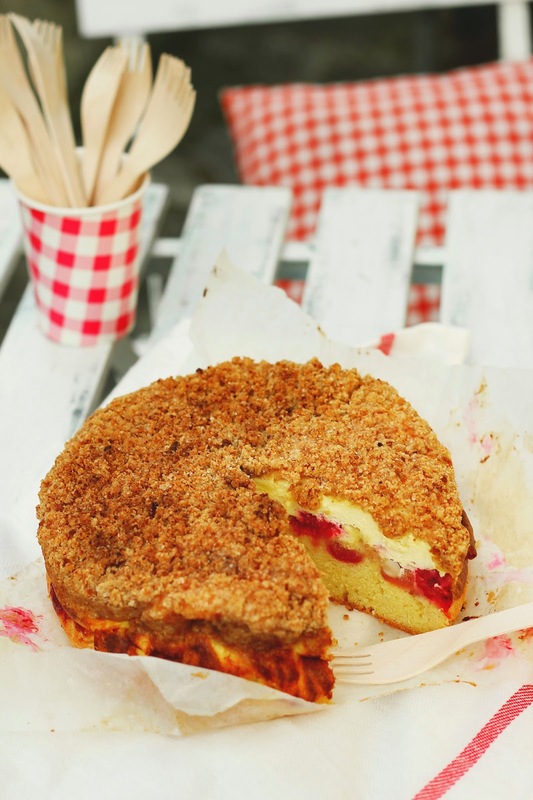 Assemble the cake: but the base in a 20 cm cake tin, spread evenly, then add the ricotta mixture, arrange the cherries and rasperries over the cheese and cover all with the crumble. Bake at 180° for 1 hour and 15 minutes. Poi preparare lo strato di formaggio mescolando la ricotta con i tuorli e poi gli albumi montati a neve. Infine preparare la base montando il burro con lo zucchero, unendo le uova uno alla volta. Aggiungere la farina setacciata con il lievito. Per assemblare la torta mettere il composto della base sul fondo di una tortiera di 20 cm, distribuendolo bene, ricoprire con lo strato di ricotta, adagiarvi sopra le ciliege e i lamponi e coprire infine con il crumble. Cuocere a 180° per 1 ora e 15 minuti.